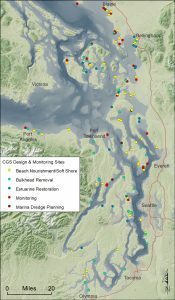 Coastal Geologic Services Inc. – Experts in Puget Sound coastal processes, management, and cost-effective design since 1993. Map of CGS projects. Click to enlarge. We specialize in analysis, design, and management of beaches, bluffs, and estuaries in the Puget Sound region. We have worked as a small, locally-owned consulting firm for 25 years, providing service with integrity. 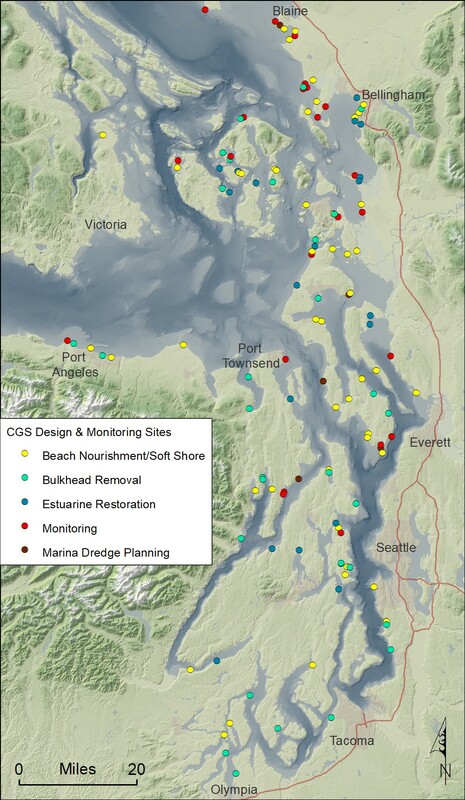 CGS has extensive experience in all Puget Sound counties and in the greater Salish Sea region, with hundreds of completed projects and a suite of Sound-wide analyses. [CGS] consulted with us about the beach erosion under one of our cabins…. [CGS] suggested we chain down a large log and let it gather the rest of the beach wood around it. That has been a fabulous solution and we now have a large raft of driftwood and stabilizing vegetation.